Yesterday, I ran the 3rd NYC Half Marathon (presented by Nike). Starting near E 85th Street, it consisted of slightly more than one full outer loop of the park (run clockwise - mama has issues with that direction, and boy do I need to tackle them), exiting the park and running down 7th Avenue, hanging a right onto 42nd Street and then finishing southbound on the West Side Highway. We had been placed in starting corrals based on our projected times. I chose to move further back to run with a friend, as I had no intentions of actually racing this half, just using it as my long run for the weekend. I spent the first 7 miles running with my friend. It was probably the worst thing I could have done to either of us, since for those 7 miles neither one of us was running our own race. I was holding her back on the uphills while she was pushing me too hard on them (with my itty-bitty legs, it takes entirely too much energy to power run up a hill; I slow down, conserve energy and then fly downhill). Therefore she lost critical time in the early miles, while I lost crucial energy that I needed for the second half of the race. She finally wised up and left me on the last hill in the park (good girl). By this point, I was tired and feeling a bit off - I was sweating, but chilled, and I knew that wasn't a good sign. The cold sweats had passed, but I was thirsty. I forced myself to stop at approximately every other water stop for Gatorade and water (in a half marathon I will generally only stop once or twice), slowing my pace down even more . I made the turn onto the highway and realized that running on concrete is no fun at all (talk about energy vampirism)! And I wasn't particularly thrilled with the view (the prettiest parts of the highway are further north). It was flat, it was straight, and I just wasn't having any of it. When I came upon the 2:10 pacing group and realized just where I stood in terms of finishing times, I had two choices - kick it up significantly for the next 4 miles and hope to finish (slightly) sub 2:10, or just lean back and enjoy the remainder of my morning. I knew that I wouldn't be happy with 2:10, and that at this point I'd be beating my legs up if I went for it. So, I turned on the autopilot and cruised to the finish in 2:12:11 (10:05 mm avg). My current PR is 1:54:42 (8:45 mm). In retrospect, there were a lot of factors involved in my less than spectacular performance. I'm still struggling to find the balance between CrossFit and running, and as such my times have slowed a bit. Of course, I hadn't trained for this half, but then again - I rarely afford them the respect they're due and have had my best race times completely unprepared. Not smart, I know, but it's how I've done it. In addition, I hadn't even so much as pretended to taper or rest - so my legs were far from fresh. But the most prominent factor affecting my race was that fact that there came a point where I just didn't care anymore. I wasn't excited and the course didn't thrill me. So I gave in and just stopped racing. Which brings me to the most important thing that I learned yesterday: I am a great runner. But as a racer there's plenty of room for improvement. As for the race itself - NYRR and Nike did a great job with the race (with the exception of the packet pick up), don't get me wrong. It was very well organized, and they took great care of the runners in terms of heat management. Truly impressive. And the spectators were great (something I'm not at all accustomed to- thanks Maria!). 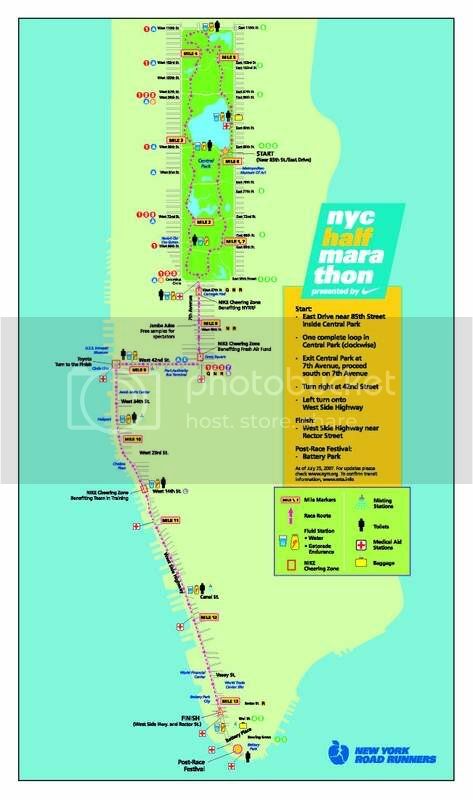 But as far as a destination half marathon? Worth the $75 entry fee? Eh, not so much. The NYRR Grand Prix series is far more enjoyable, in my opinion. Will I throw my name into the lottery for next year? Probably. Why? 'Cause I'm an idiot, of course. good job on your race. You are a fantastic runner and should just throw the watch away when running a race as a training run and not racing it!!! it's not worth your mental fatigue over your time and pace. Did you get a nice Nike shirt at least? Thanks, chica! I swear, the only thing that pulled me along the Henry Hudson was looking for you between miles 10 and 11! Sorry that it wasn't too much fun for you though. Hope you are feeling okay today!